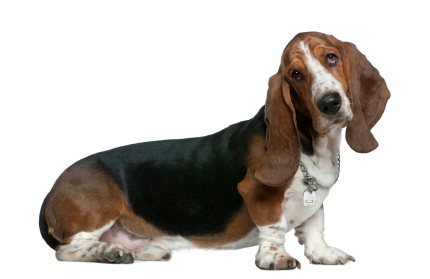 Learn about the temperament and personality of the Basset Hound. Discover what he's like to live with, his traits and characteristics and how he generally behaves. And look at lots of Basset Hound photos. Known as the clown of the canine world, a Basset Hound is sure to bring you some laughs. The Basset Hound is a terrific family pet, because they are intelligent, easygoing, sociable, loving, and loyal. They are great with children and other dogs, and are friendly with strangers. They love to be part of the family and go for rides in the car, watch TV with you, and play in the yard. They are also prone to mischief. They are a pack hound, and are uncomfortable when left alone for hours at a time. If no humans are available, a Basset will need another dog or cat to keep him company. The Basset Hound is famous for being stubborn and strong-willed. He is a master of getting his own way. He will hurl his 65 pounds onto your lap when you are least expecting it, sometimes when you are sleeping. Even though the Basset was bred to be a hunting hound, they often behave more like an oversized lapdog. A Basset needs to be kept on a leash or safe in a fenced-in area. He will often follow a scent that interests him, which can sometimes lead him into dangerous situations, like a road. Even though they are not high energy dogs, they are capable of impressive bursts of speed. While Bassets can be lazy and love to sleep for hours in a patch of sun, they also love to go for long, unhurried walks. If you want to own a Basset, you must be comfortable with drool and slobber. Bassets love to eat and will beg for and steal food any chance they get. They are not opposed to climbing up onto the table to lick plates. They are also good for cleaning up food spills, but are infamous for snatching a cracker out of a young child's hand. It is not safe for Bassets to do much jumping, so a Basset owner must be prepared to provide a boost now and again, helping their Basset into a car and onto the couch. Bassets are often difficult to housetrain and are prone to gassiness. They love to "sing," which your neighbors might interpret as baying or howling. The Basset Hound is a very heavy shedder. He sheds an awful lot of hair! You'll find hair all over your home, stuck to everything! You'll probably even find it in the butter!